Acharya Jagdishji Maharaj is more than a just a spiritual mind, who has a blessings of Maa Gange and Lord Krishna. He is known as a Great Philosopher, Potent Bhagwat Kathavachak and Practitioner of Yoga & Meditation. He was born in a middle-class Hindu family at the foothills of the Himalayas on the land of spirituality in Uttrakhand on 17th, February 1974 in Patigaon village of Champavat. His parents aptly named him Jagdish 'the Lord of the world' as they were told by the astrologers that this boy would one day shine. In his early childhood, Acharyaji was closely attached by his mother named Bhagirathi. She was well cultured, humble and a spiritual lady she used to perform daily ritual like Puja, havan and chanting of Sanskrit Mantras. She has given very good account of herself to impart the best knowledge and moral values. She was not only a mother but also a mentor and a guide of his early childhood. His mother Bhagirathi used to tell many stories of old Lord Krishna and Maa Ganga. One day his mother told him that they are going for Ganga Darshan in Haridwar. The small child was so happy and he was very much excited to see Ganga and land of Indian deities. However, the day has come to see Ganga with naked eyes; it was truly an exhilarating experience for a small child. He came very close to his mother and cheered loudly “MAA” I have two mothers one is you and other is Maa Ganga. Mother was so happy and said yes my son, Ganga is mother of all Hindus, I may die but she will remain forever with you. The Ganga darshan has left a very deep impact on the heart of child. However, as we know that nothing is permanent in this world except the change and unfortunately change has come to say goodbye to his mother in the age of 6 years. He felt himself helpless without his mother and the only thing remained in his mind was memories of Ganga Darshan in Haridwar. The journey was on track through various stages and circumstances to teach the lesion of life. The members of his family noticed that young boy's vision itself was different from the others. During this period an amazing incident took place which was a turning point in his life, very often he began to have spontaneous experiences of Maa Ganga and Lord Krishna. These spontaneous experiences enforced him to leave the family at the age 11 years. An 11 years old child was fully determined with the blessing of his mother to choose the path of truthfulness, peace and harmony. He decided to move to Haridwar to study all the spiritual texts such as Sanskrit Language, Bhagavad Gita, Vedas, Puranas, Upnishads. During his stay in Haridwar he interacted with great philosophers, scholars, sages and participated in various events organized by of intellectual societies. Jagdish ji was still in constant search of self-realization and continued his search while completing his Degree of Acharya. One day the followers of Shrimad Bhagwat and a group of his disciples came to request him to visit Mathura during Srikrishna Janmasthami. Acharyaji could not reject the request of his disciples and visited Mathura. It was a lifetime experience for Acharyaji to know more about lord Krishna and his teachings. 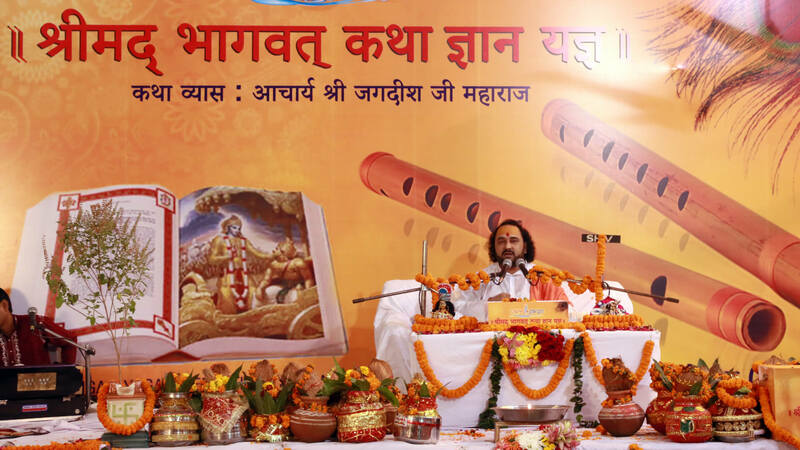 The inspirational and influential role of Lord Krishna extended his stay in Mathura. The Character of Lord Krishna made him an enthusiastic seeker to know more about the doctrines of Shrimad Bhagwat. He started learning more about the characters of Mahabharata and Lord Krishna. He found the role of ‘Ganga Putra’ Bhishma Pitamah much more inspirable in the Indian dynasties. The Bhishma promised her mother Ganga not to marry throughout his life to protect the Hastinapur the kingdom of Bharat Barsh. During his stay in Mathura Acharyaji decided to spread the story of Shrimad Bhagwat among the society and turned as a Shrimad Bhagwat Katha Vachak. After coming from Mathura, Swami ji decided to have Ganga Darsan as this thought was lying in Achryaji’s mind since his childhood. However, Acharyaji started his journey with of his disciples and reached to the birth place of Ganga at Gangotri. What a wonderful seen it was !! He said “Maa” with closed eyes, and felt as if his mother Bhagirathi is standing in front of him. He became so happy to see Ganga at Gangotri, It was so transparent, pure, clean and beautiful. He continued his journey and visited all most cities and places where Maa Ganga flows. The journey came to an end with lots of pain and desperation. He saw how people are dumping raw sewage, plastic bags and bottles, industrial effluents, human waste, chemicals from tanneries, discarded idols, cow dung, partially cremated corpses, garlands of flowers, human bodies, animal carcasses, butcher's offal, chemical dyes from and construction waste. Acharyaji could not sleep whole night after seeing his Maa Gange in such worst condition and he took resolution to dedicate his life for cleaning of Holy Ganga. Acharyaji is now totally dedicated his life, efforts, time, and initiatives to Maa Gange and Shrimad Bhagwat. He is working for re-establishment of Maa Ganga in its original form of purity and spreading the holy message of Shrimad Bhagwat. 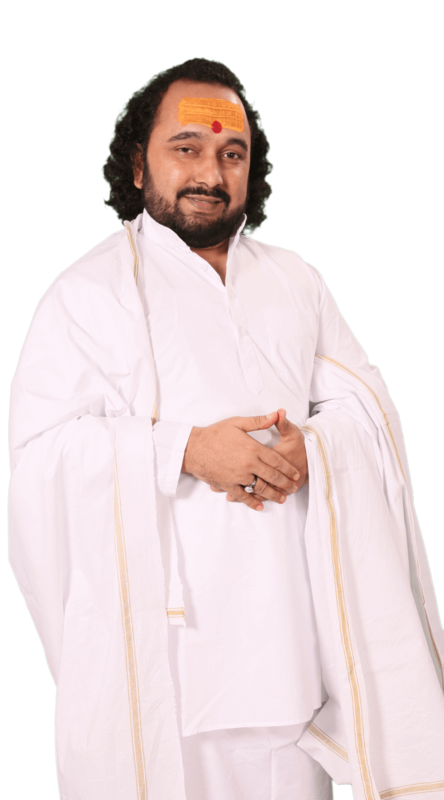 Acharyaji's vision revolves around spiritual, educational, healthcare, environmental, social, moral and cultural activities to benefit the maximum number of the people all across the globe.